Chemistry Exhibition Projects : Chemistry focused science exhibition projects are ways for students of any age to showcase their scientific learning. With a chemistry science exhibition project, students learn about and see chemical processes in real world while also learning how to record the results of experiments and present them to an audience. school students of class 5, 6, 7 and 8 can conduct simple experiments with harmless chemicals found in their own town. To use chemical reactions between water and potash alum(Potassium) in the creation of various crystal formations. Crystals consist of an orderly arrangement in the molecular structure of a solid object, this pattern known as crystallization. Crystals can be man-made by heating water with a chemical known as potash alum. Many geometrical shapes can be created through this process, such as cubic, hexagonal, tetragonal crystals. To create your own soap using a chemical process known as saponification. This is a reaction where an ester is heated with an alkali ( such as sodium hydroxide) to produce a free alcohol and an acid salt ( alkaline hydrolysis of a fat or oil ) to make soap. You will use the highly alkaline chemical called lye and convert it into fats and fatty acids. Which will then yield soap. Water "H2O," consists of two hydrogen atoms covalent bonded to a single oxygen atom. While water formed through countless chemical reactions, the most efficient way to create a water molecule out of oxygen and hydrogen atoms is to burn hydrogen gas (H2) in the presence of oxygen gas (O2). Atoms are not created or destroyed during chemical reaction, they are just rearranged from the reactants to form the products. This is the reason symbol equations must be balanced. If a chemical reaction is completed in a closed system (when nothing extra can get in and nothing can escape), then the mass will remain constant. But, if the chemical reaction happens in an open system (where air can get in and out), then mass may seem to change. In this projects we will explore the mass changes in chemical reactions and attempt to explain why they have occurred. When burning, the candle uses the oxygen in the air. The water made by burning reduce the volume about 1/1700 after cooling and becoming the liquid. As for remaining carbon dioxide, it reacts with the sodium hydroxide and the sodium carbonate is made. It is absorbed to the solution. Therefore, water which is almost same volume of the oxygen rises in the container. The purple color in purple and red cabbage comes from a class of pigment molecules called anthocyanins. It turns out that anthocyanins are found in flower petals, leaves (it makes them turn red in the fall.) and some fruits such as blueberries. A voltaic cell is an electrochemical cell that uses a chemical reaction to produce electrical energy. The important parts of a voltaic cell: The anode is an electrode where oxidation occurs. The cathode is an electrode where reduction occurs. We can make an electric cell by using easy available materials. Let’s try it. A fruit battery is a simple battery made for the purpose of education. Typically, a piece of zinc metal (such as a galvanized nail) and a piece of copper (such as a penny) are inserted into a lemon. The fruit has citric acid, which will cause the same reaction as other weak acids. Tomatoes and citrus fruits usually contain enough acid to affect the galvanometer. 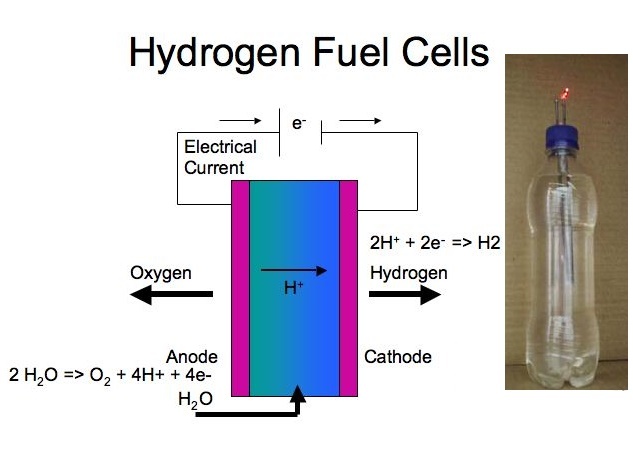 Fuel cell combines hydrogen and oxygen to produce electricity, heat, and water. Fuel cells are often compared to batteries. Both convert the energy produced by a chemical reaction into usable electric power.